“I had no idea it was this insane,” Seattle newcomer Colleen Williams said about her 90-minute commute from Rainier Valley to Bellevue. 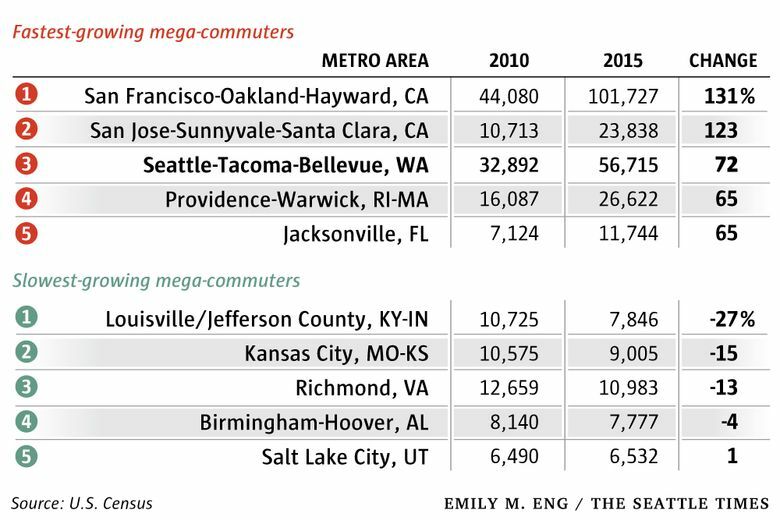 The region’s growth of mega-commuters ranks among the top in the nation, writes FYI Guy. Ryan Maas knew, of course, that Seattle was more expensive than Omaha. Even so, he found himself caught off guard by the grim reality of the real-estate market here. After accepting a job transfer in Seattle earlier this year, Maas began the search for a new home for his family. Prices kept pushing his house hunt farther south, right into Pierce County. And that, in a nutshell, is how Maas became a “mega-commuter,” often defined as someone who spends 90 minutes or more on a one-way trip to work. His morning starts with a drive to the nearby park-and-ride, where he catches the bus to the Sumner train station. From there, he takes the Sounder to King Street Station in Seattle, where he hops on a shuttle to his job at the U.S. Army Corps of Engineers in the city’s Sodo industrial district. Elapsed time: 1 hour, 45 minutes. Back in Omaha, his commute was just 20 minutes. “It’s been an adjustment,” he said. Census data show that a lot more of us are making such adjustments these days. In 2015, about 57,000 people in the Seattle area endured commutes of at least 90 minutes from home to work, a jump of nearly 24,000 since 2010. 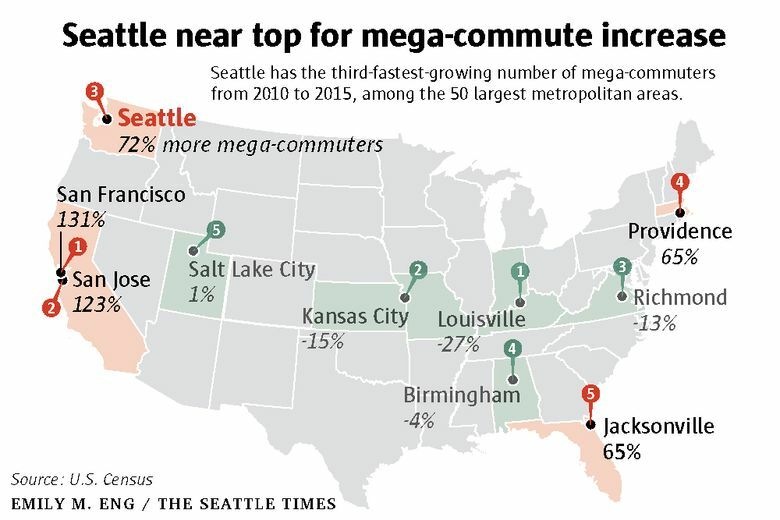 That equals a 72 percent increase in just five years, ranking Seattle third among the 50 largest U.S. metros for the rate of growth for mega-commuters. Who ranks ahead of us? Not surprisingly, two other metros where sky-high home prices have folks moving to increasingly far-flung places: San Francisco and San Jose, California. The rise of mega-commuting is surely symptomatic of our region’s shortage of affordable housing. But other factors play a role, including personal choice — for some more than others. Software architect Scott Johanson took on a massive increase in his commute times recently in order to purchase his dream home. He and his wife sold their house in Renton and bought just south of Olympia. His drive to work in Seattle jumped from 9 miles to 76 miles each way. Johanson says folks think he was crazy to willingly take on that commute — until they see the house. He says he’s able to work from home a couple of days a week, which makes a huge difference. And while the drive to Seattle is a slog, Johanson says it doesn’t bother him too much. He enjoys listening to news radio and podcasts. 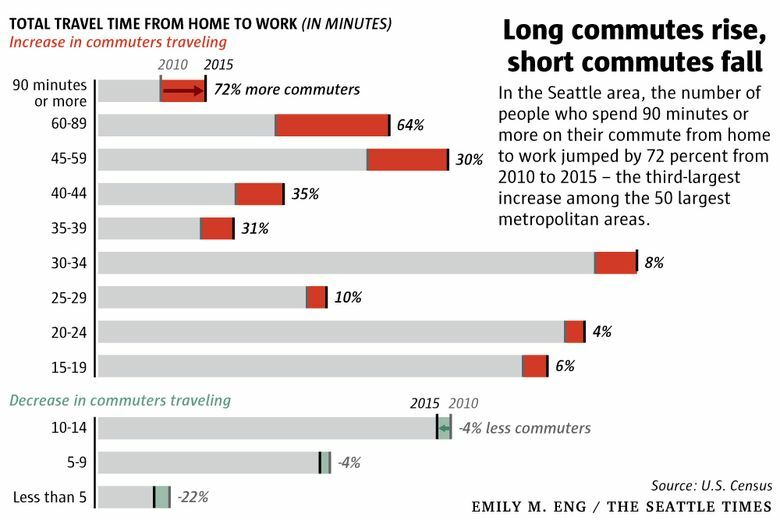 While the number of people with long commute times is growing fast in Seattle, the number with commutes of less than 15 minutes declined by 21,000 between 2010 and 2015. That surprised me, since more people than ever are living in the downtown cores of Seattle and Bellevue. Then again, even if you’re not commuting a very long distance, the area’s increased traffic congestion could still slow you down. Williams and her boyfriend moved to Seattle from Brooklyn, New York, last year. After the couple settled in Rainier Valley, she took a job as a digital content writer in downtown Bellevue. 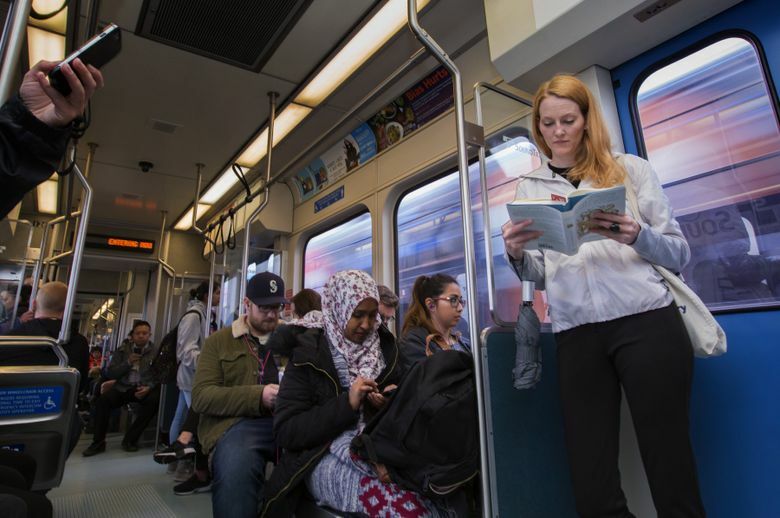 Her journey to work starts with light rail from Othello to the International District, where she transfers to the 550 bus to Bellevue. What she’s not used to is the 90 minutes that it takes her to get to work. Back in New York, her Brooklyn-to-Manhattan commute was a 15-minute subway ride. On the plus side, all that time on the bus means she’s never been so well-read. “I’m flying through books,” she said. While mega-commuters are still a small percentage of local commuters — 3.2 percent — it wasn’t that long ago when it was almost unheard of to spend so much time on a trip to work. In 1980, just one-half of 1 percent here had such long commutes. Follow FYI Guy Gene Balk on Twitter @genebalk.